"Some tracks from the soon to be released third album by electronoisemakers Ghostigital. Ghostigital is comprised of wordsmith/singer/poet/music doctor Einar Örn Benediktsson, formerly of Björk's band The Sugarcubes, and producer Curver Thoroddsen. Also featuring on this Record Store Day exclusive, limited edition release are Alan Vega (Suicide), Nick Zinner (Yeah Yeah Yeah's) and NY rapper Sensational. The Ghostigital project began as the name of Einar's first solo album. 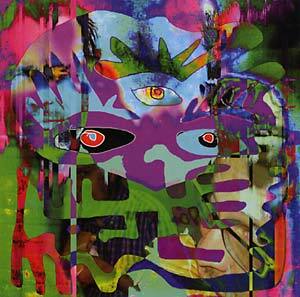 The album, released in 2003 on Honest Jon's Records and featuring Damon Albarn, was produced by Curver who later made up the Ghostigital duet with Einar. A second album, In Cod We Trust, was released in March 2006. The third, also featuring Damon Albarn, David Byrne and others, will be released in June 2012."